I was delighted to discover Restaurant F and B during my most recent trip to Burgundy. Eating in Burgundy can be tough after a while. Beaune’s best restaurants are expensive and can also be a bit stuffy. 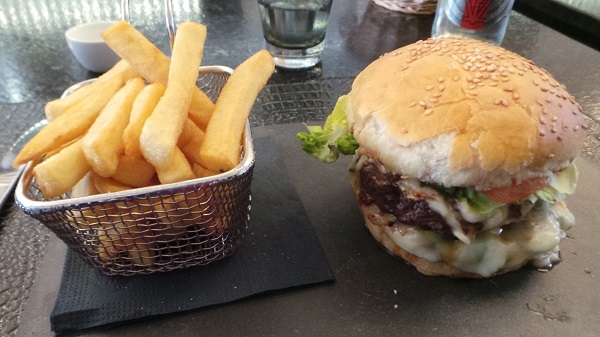 Located just off the Place Carnot, Restaurant F and B is the perfect place to enjoy an informal lunch or dinner without skimping on quality. Most of the dishes are creative, modern takes on bistro classics. I had a busy day of tastings lined up, so I opted to skip wine, but the list is extensive. Navigating the list does take a little bit of work, as many of the selections are from commercially minded estates. My eye caught a number of wines from smaller producers, including Antoine Jobard, François Carillon, Jacques Carillon, Lafon and Tollot-Beaut, among others, that I would have loved to drink. The gazpacho with tomato tartare is absolutely delicious and bursting with intensity. 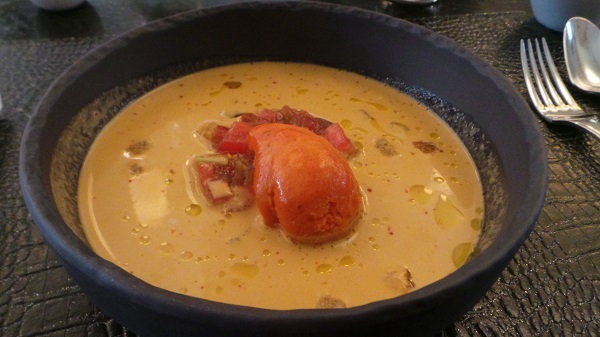 Far from simple summertime dish F and B’s gazpacho presents an interplay of textures and flavors that is compelling. While I wait for my second course, I see a number if hugely appealing dishes coming out of the kitchen, which only make me think about when I might be able to return. The Charolais beef burger and frites is pretty decadent, but after a few weeks on the road, I am a bit homesick, so the burger is super delicious and satisfying. A quick espresso follows, and then it’s time to get back to work. Readers looking for an informal, casual restaurant in Beaune with delicious food will want to check out Restaurant F and B. In the summer, the outdoor tables make F and B an ideal place to while away a few hours and take in the ambience of Beaune, one of France’s most charming small towns.